MRL/Mp-lpr/lpr (MRL/lpr) mice spontaneously develop systemic lupus erythematosus (SLE)-like disease. The natural history of the pulmonary involvement and the underlying mechanism of leukocyte infiltration into the lungs of MRL/lpr mice and SLE patients remains elusive. We aimed to investigate the expression profiles of chemokines and chemokine receptors in the lung of the SLE-prone mouse. We examined the correlation between lung inflammation and expression of IP-10 (interferon-γ-inducible protein 10), a CXC chemokine, and TARC (thymus- and activation-regulated chemokine), a CC chemokine, in MRL/lpr mice, MRL/Mp-+/+ (MRL/+) mice, and C57BL/6 (B6) control mice. The extent of cell infiltration in the lung was assessed histopathologically. Reverse transcriptase PCR showed up-regulation of IP-10 mRNA expression in the lungs (P < 0.05) of MRL/lpr mice, in comparison with MRL/+ or B6 mice. The increase paralleled increased expression of a specific IP-10 receptor, CXCR3, and correlated with the degree of infiltration of mononuclear lymphocytes. In contrast, lung expression of TARC and its specific receptor, CCR4, were suppressed in MRL/lpr mice. Immunohistology showed that macrophage-like cells were the likely source of IP-10. Flow cytometric analyses revealed that the CXCR3-expressing cells were mainly infiltrating CD4 T cells and macrophages, which correlated with the degree of mononuclear lymphocyte infiltration. Recent data suggest that Th1 cells and Th1-derived cytokines play an important role in the development of SLE-like disease in MRL/lpr mice. Our results suggest that IP-10 expression in the lung is involved, through CXCR3, in the pathogenesis of pulmonary inflammation associated with migration of Th1 cells. MRL/Mp-lpr/lpr (MRL/lpr) mice spontaneously develop a severe autoimmune syndrome resembling systemic lupus erythematosus (SLE) . The natural history of diffuse pulmonary involvement seen in MRL/lpr mice as well as SLE patients has not been clearly defined. Moreover, the mechanisms underlying leukocyte infiltration into the lungs of MRL/lpr mice, especially the roles of chemokines, are still unknown. Chemokines belong to a gene superfamily of chemotactic cytokines that share substantial homology of four conserved cysteine amino acid residues [2–4]. The CXC family of chemokines (e.g. interleukin 8 [IL-8], growth-regulated oncogene [GRO], and interferon [IFN]-γ-inducible protein 10 [IP-10]), in which the first two cysteines are separated by another amino acid residue, is chemotactic for neutrophils and T cells. On the other hand, the CC chemokine family (e.g. macrophage inflammatory protein [MIP]-1, macrophage chemoattractant protein-1, and regulated on activation, normal T-cell expressed and secreted [RANTES]), in which the first two cysteine residues are juxtaposed, is chemotactic for monocytes and subpopulations of T cells. The chemokines appear to play key roles in inflammatory and immune responses mediated by their respective affected cell populations. IP-10, a member of the CXC chemokine family, is expressed and secreted by monocytes, fibroblasts, and endothelial cells after stimulation with IFN-γ [2, 5] and has important roles in the migration of T cells into inflamed sites. IP-10 also promotes the regression of angiogenesis, in contrast to IL-8 [6, 7]. The immune/inflammatory responses and pathogenesis of certain diseases correlate with the balance between T helper type 1 (Th1) and T helper type 2 (Th2) responses [8–10]. A Th1/Th2 cytokine imbalance with a predominance of Th1 cytokines, including IFN-γ, is suggested to be of pathogenetic importance in autoimmune diseases, such as rheumatoid arthritis and SLE [11–13], while predominance of Th2 cytokines, including IL-4, is important in allergic reactions, such as bronchial asthma . Recent evidence indicates that receptor expression dictates the spectrum of action of chemokines, as shown for Th1 and Th2 cells. The Th1 phenotype expresses certain chemokine receptors, including CXCR3 and CCR5, ligands for IP-10 and MIP-1β, respectively [15, 16], while the Th2 phenotype expresses CCR4 and CCR8, ligands for thymus- and activation-regulated chemokine (TARC) and macrophage-derived chemokine and MIP-1β, respectively. Further studies demonstrated that polarized T cells differentially respond to IP-10 for Th1 cells and to macrophage-derived chemokine for Th2 cells [17, 18]. Although some evidences exist for the importance of Th1 cytokines in the pathogenesis of SLE-like disease in MRL/lpr mice, the specific profiles of IP-10, of ligand for chemokine receptor, and of CXCR3 of Th1 phenotype in various aspects of murine lupus remain incompletely resolved. In the present study, we focused on the expression profiles of IP-10 and CXCR3 as the pathological mechanism of pulmonary involvement in the lupus-prone mouse, through the regulation of Th1/Th2 polarization. Female MRL/Mp-lpr/lpr (MRL/lpr), MRL/Mp-+/+ (MRL/+) and C57BL/6 (B6) mice were purchased from the Charles River Japan (Yokohama, Japan) and bred in our facility. MRL/+ mice, which have the same genetic background as MRL/lpr mice but lack the lpr mutation, and B6 mice were used as disease control against MRL/lpr mice. Goat antimurine IP-10 and rabbit antimurine CXCR3 polyclonal antibodies and preimmune control antibodies were purchased from Genzyme/Techne (Cambridge, MA, USA) and Zymed Laboratories (South San Francisco, CA, USA), respectively. Monoclonal rat anti-Mac-3 antibody detects murine macrophages (BD PharMingen, San Diego, CA, USA). Animal experimentation was performed in accordance with protocols approved by the Animal Care Committee of Showa University. Lungs were inflated with 1 ml of physiologic saline and fixed with 4% paraformaldehyde, and paraffin sections were prepared and stained with H & E. Pulmonary infiltration and inflammation were evaluated using a scoring system similar to the pathological scoring system described previously. Briefly, the perivascular and peribronchiolar infiltrates were assessed semiquantitatively in >10 vessels per section and in >10 bronchioli per section (score: 0 = none; 1 = less than three cell layers surrounding <50%; 2 = three to six cell layers surrounding >50%; 3 = more than six layers), in accordance with protocol reported by Tesch and colleagues . In addition, the infiltrates in alveolar area were assessed in 20 high-power fields/section (score: 0 = none; 1 = 10 infiltrating mononuclear cells; 2 = 20 infiltrating cells; 3 = more than 20 infiltrating cells) based on the protocol described by Seggev and colleagues . Lung tissues were inflated with optimal cutting temperature (OCT) compound (Tissue-Tek II, Miles Laboratories, Naperville, IL, USA) and snap frozen. Before staining, 5 μm frozen sections were fixed for 30 min in ice-cold acetone. Endogenous peroxidase activity was quenched by incubating the slides for an additional 30 min in absolute methanol and 3% hydrogen peroxide. The slides were then incubated with polyclonal antibodies against murine IP-10 or murine Mac-3, or appropriate control IgG. Biotinylated antirabbit or antirat IgG (Biogenex, San Ramon, CA, USA) and peroxidase-conjugated streptavidin were used as second and third reagents, respectively, while the optimal color was developed using a 3,3-diaminobenzidine tetrahydrochloride (DAB) detection kit (Nichirei, Japan). After rinsing with distilled water, the slides were counterstained with Mayer's hematoxylin. For harvesting lung-infiltrating leukocytes, the right lung was perfused with PBS, dissected out en bloc from the chest cavity, and then minced with scissors. Each sample was incubated for 30 min at 37°C on a rocker in 10 ml digestion buffer (Dulbecco's modified Eagle's medium with 10% fetal bovine serum and 1% collagenase). The cell suspension and undigested fragments were further dispersed by drawing them up and down through the bore of a 10-ml syringe. Cells were washed in 1 × PBS and resuspended at a density of 1 × 106 cells/ml in PBS containing 2% fetal bovine serum. The viability of dispersed cells from these preparations was greater than 85–90% as confirmed by trypan blue dye exclusion. After incubation with Fc block (BD PharMingen) for 15 min, the cells were further stained with the specified antibody (anti-CD3-FITC, anti-CD4-PE, CD8-PE, anti-B220-PE, or antimacrophage-FITC, purchased from BD PharMingen and Serotec, Raleigh, NC, USA, respectively) at a concentration of 10 μg/ml, or rabbit anti-CXCR3 antibody (10 μg/ml), and then the second antibody (biotin-conjugated antirabbit IgG) and third reagent (CyChrome-conjugated streptavidin from BD PharMingen). An isotype control antibody conjugated with the respective fluorescent or biotinylation tag was used for negative control staining of each specific antibody. After 30 min on ice, the cells were washed with PBS and the fluorescence intensity was measured on a three-color FACScan flow cytometer (Becton Dickinson, Mountain View, CA, USA). Finally, the data were analyzed using CellQuest computer software (Becton Dickinson). Data were analyzed on a Power Macintosh® computer using a statistical software package (StatView, Abacus Concept, Inc, Berkeley, CA, USA) and expressed as mean ± SEM. Data groups were compared by analysis of variance; parameters whose variances were determined to be significantly different were then compared by Student's t-test. A P value less than 0.05 denoted the presence of a statistically significant difference. We first examined the development of pulmonary inflammation in MRL/lpr, MRL/+ and B6 mice. Since MRL/lpr mice develop severe pulmonary inflammation with advancement of age, mice were humanely killed at the age of 4 months and their lungs were prepared for histopathological analysis. Fig. 1 shows representative histopathological sections (Fig. 1a) and the pathology scores (Fig. 1b) of lungs from each group. The mononuclear cell infiltration of the pulmonary perivascular and peribronchial lesions and of the alveolar area of MRL/lpr mice was significantly greater than in MRL/+ or B6 mice (Fig. 1). These results are in agreement with those reported previously [19, 22]. Pulmonary infiltration and inflammation in MRL/lpr, MRL/+, and B6 mice. The lungs of 4-month-old mice were stained with hematoxylin and eosin. (a) Representative histopathological sections and (b) the pathology scores of lungs of each mouse are shown. Pathology scores are expressed as mean ± SEM of at least 15 sections from five mice of each mouse strain. There was significantly greater mononuclear cell infiltration into the pulmonary perivascular and peribronchial lesions and the alveolar area of MRL/lpr mice than in the MRL/+ (*P < 0.05) or B6 (**P < 0.01) mice. (Original magnification: 100×). Cells obtained from the whole lung preparation from mice at the age of 1 or 4 months were diluted and stained with appropriate antibodies for phenotype analysis using flow cytometry. As shown in Fig. 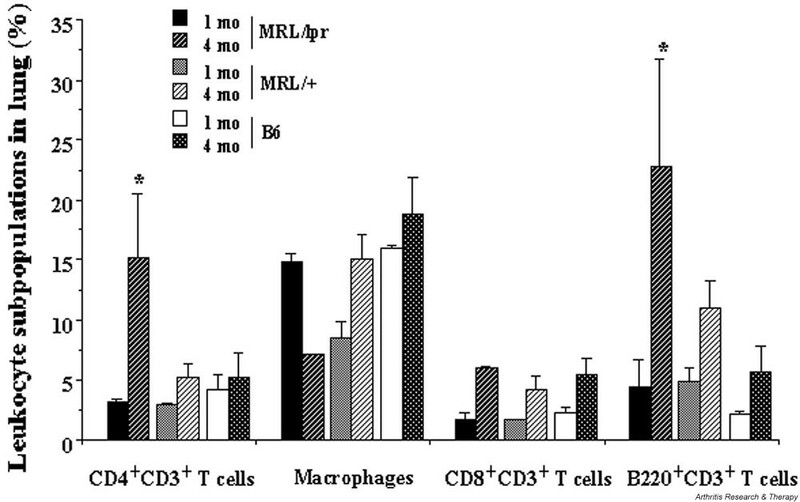 2, the percentages of CD4+CD3+ T cells and CD4-CD8- B220+CD3+ T cells (double negative [DN] B220+ T cells) were greater in 4-month-old MRL/lpr mice than in MRL/+ and B6 mice. Conversely, the proportion of macrophages in the lungs was significantly lower in the 4-month-old MRL/lpr mice than in the other two mouse groups, indicating that the increase of these infiltrating T cells may be responsible for the low number of macrophages in lung. These results indicate that the development of tissue injury in MRL/lpr mice is characterized by the accumulation of T cells, especially DN B220+ T cells and CD4+CD3+ T cells, which may contribute to the development of the pulmonary inflammation seen in MRL/lpr mice [19, 23]. Phenotype analyses of infiltrating cells in the lungs of MRL/lpr, MRL/+, and B6 mice. Cells obtained from whole lung preparations from 1- and 4-month-old mice (n = 5 per group) were stained by appropriate antibodies for phenotype analysis using flow cytometry. Data are expressed as percentages of cells, as described in Materials and methods. The percentages of CD4+CD3+ T cells and CD4-CD8- B220+CD3+ T cells (double negative [DN] B220+ T cells) were significantly increased, by 15.2% and 22.7%, respectively, in 4-month-old MRL/lpr mice in comparison with MRL/+ and B6 mice (*P < 0.05). The above histopathological pattern in MRL/lpr mice appeared to correlate with the influx into the lungs of mononuclear cells, especially DN B220+ and CD4+ T cells. Since it has been demonstrated that IFN-γ is up-regulated during organ inflammation and damage is seen in MRL mice [24, 25], we postulated that IP-10, especially IFN-γ-related chemokines, may be involved in the recruitment of infiltrating cells and in the development of spontaneous lupus-like clinical features of the murine MRL/lpr. Therefore, using semiquantitative RT-PCR and Southern blotting, we examined the serial changes in the expression of IP-10 and CXCR3, its specific receptor, during the development of pulmonary infiltration. As shown in Fig. 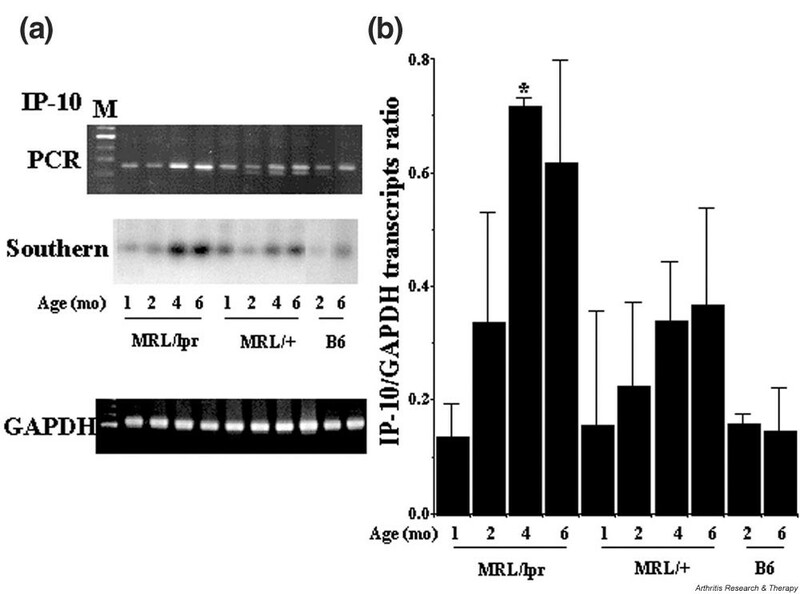 3, IP-10 mRNA expression in the lung of MRL/lpr mice increased in an age-dependent fashion and correlated with the development of pulmonary inflammation as defined by mononuclear cell infiltration, in comparison with these phenomena in MRL/+ and B6 mice. In MRL/lpr mouse lung, immunolocalization showed IP-10 (Fig. 4a, arrows) to be mainly associated with infiltrating mononuclear cells, especially macrophage-like cells surrounding the lesion of lymphocytic infiltration, identified by morphology and by reactivity with anti-Mac-3 antibody (Fig. 4b, arrowheads). On the other hand, tissue sections stained with preimmune control IgG showed little or no specific staining (results not shown). We also examined the expression pattern of CXCR3 transcripts. 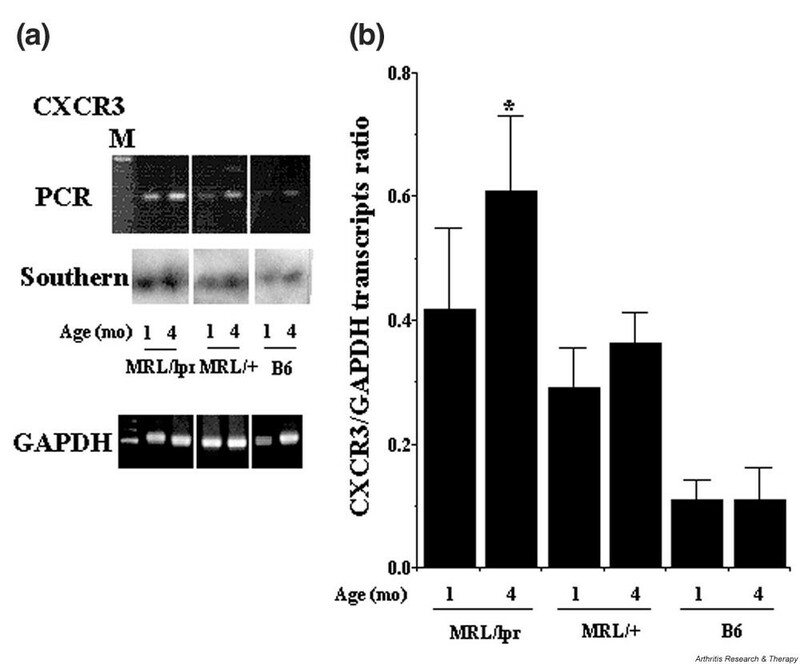 Interestingly, although a weak expression of CXCR3 transcript was seen in the lungs of B6 mice, the expression pattern in the lungs of MRL/lpr mice was higher than in MRL/+ mice and was correlated with the age-related changes in the expression of IP-10 (Fig. 5a,5b). Time course of IP-10 transcription in MRL/lpr, MRL/+, and B6 mice. Whole RNA was isolated from mouse lung tissues at the indicated times (months); transcribed mRNA was amplified by RT-PCR. (a) Representative expression of IP-10 mRNA and Southern blot hybridization with internal probes; GAPDH primers were used as an internal control. Data are representative of three independent experiments. Lane M: molecular weight markers (100-base-pair ladder). (b) IP-10 transcripts were quantitated and normalized to GAPDH as IP-10/GAPDH transcripts ratio. Data are expressed as mean ± SEM of three independent experiments; *P < 0.05 vs individual age (4 months) of MRL/+ mice and B6 mice. GAPDH, glyceraldehyde-3-phosphate dehydrogenase; IP-10, interferon-γ-inducible protein 10; PCR, polymerase chain reaction; RT-PCR, reverse transcriptase PCR. Immunohistochemical localization of IP-10 in the lung of 4-month-old MRL/lpr mice. Frozen lung sections were stained with antibodies against (a) IP-10 and (b) macrophages. The significant presence of cell-associated IP-10 antigen (a, arrows) seems to contribute to infiltration of macrophages (b, arrowheads). (Original magnification: 200×). IP-10, interferon-γ-inducible protein 10. Time course of CXCR3 transcription. Whole RNA was isolated from lung tissues of 1- and 4-month-old MRL/lpr, MRL/+, and B6 mice; transcribed mRNA was amplified by RT-PCR. (a) Representative expression of CXCR3 mRNA and Southern blot hybridization with internal probes; GAPDH primers were used as an internal control. Data are representative of three independent experiments. Lane M: molecular weight markers (100-base-pair ladder). (b) CXCR3 transcripts were quantitated and normalized to GAPDH as the CXCR3/GAPDH transcripts ratio. Data are expressed as mean ± SEM of three independent experiments; *P < 0.05 vs B6 mice (4 months); the difference between MRL/lpr and MRL/+ mice (4 months) was not statistically significant. GAPDH, glyceraldehyde-3-phosphate dehydrogenase; PCR, polymerase chain reaction. To further examine the phenotype of cells expressing CXCR3, we analyzed the expression of CXCR3 as well as CD3, CD4, B220, and macrophages on migrating leukocytes isolated from the lungs, by flow cytometry (Fig. 6). In lungs of 4-month-old MRL/lpr mice, CXCR3 expression was significantly elevated on CD4+CD3+ T cells and macrophages. Furthermore, the up-regulated expression was age-dependent, correlated with the degree of inflammation scores of the lungs, and paralleled the expressional patterns of both IP-10 and CXCR3 (Figs 2, 3, and 5). 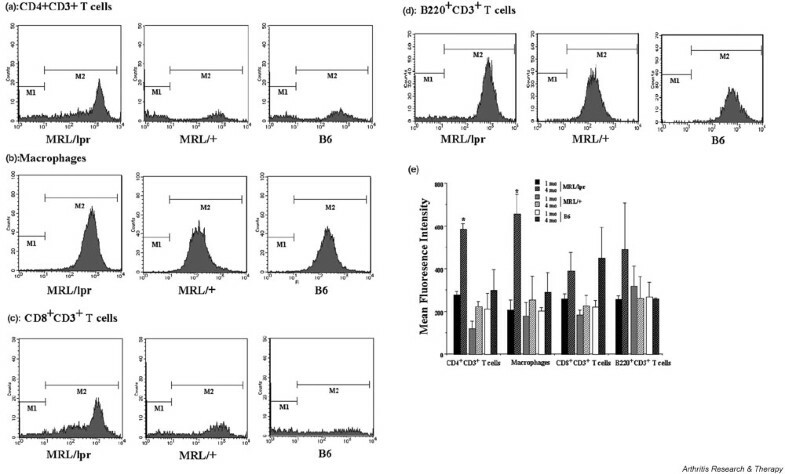 The relative numbers of CXCR3-expressing CD8+ T cells and B220+ T cells in MRL/lpr mice were higher, though not significantly higher, than those in MRL/+ and B6 mice. Phenotype analyses of CXCR3-expressing infiltrating cells in the lungs of 1- and 4-month-old MRL/lpr, MRL/+, and B6 mice. Mononuclear leukocytes isolated from the lungs were stained with antibodies against CD3, CD4, CD8, B220, macrophage, or CXCR3. The cells were gated for either (a) CD3+CD4+, (b) macrophage, (c) CD3+CD8+, or (d) CD3+B220+, and were analyzed for the level of CXCR3 expression by flow cytometry. (a–d) Histograms of the lungs from 4-month-old mice are representative of three independent experiments. (e) Mean fluorescence intensity of CXCR3 expression (M2) on gated cells, expressed as mean ± SEM (n = 3); M1, background intensity of isotype-matched control staining. CXCR3 expression was significantly higher on CD4+CD3+ T cells and macrophages in 4-month-old MRL/lpr mice lungs than in MRL/+ and B6 mice (*P < 0.05). To elucidate more clearly the dysregulation between Th1 and Th2 cytokines in the pathogenesis of murine lupus, we examined the profiles of the expression of TARC (Th2 type chemokine) and its receptor, CCR4, in the lungs. As shown in Fig. 7, expression of TARC transcripts was inhibited in the lungs of MRL/lpr mice in comparison with the lungs of normal B6 mice. A similar kinetic pattern for the expression of CCR4 was observed (Fig. 7c). Taken together, the above findings demonstrated that the observed imbalance in the enhanced expression of IP-10/CXCR3 rather than TARC/CCR4 expression contributed to the progressive lupus-like pathology in the lungs of MRL/lpr mice. Finally, to confirm the importance of Th1-dominant responses in lupus-like pathogenesis, mRNA transcripts of classical Th1 and Th2 cytokines (IFN-γ and IL-4, respectively) in the lungs and lymph nodes were also determined (Fig. 8). 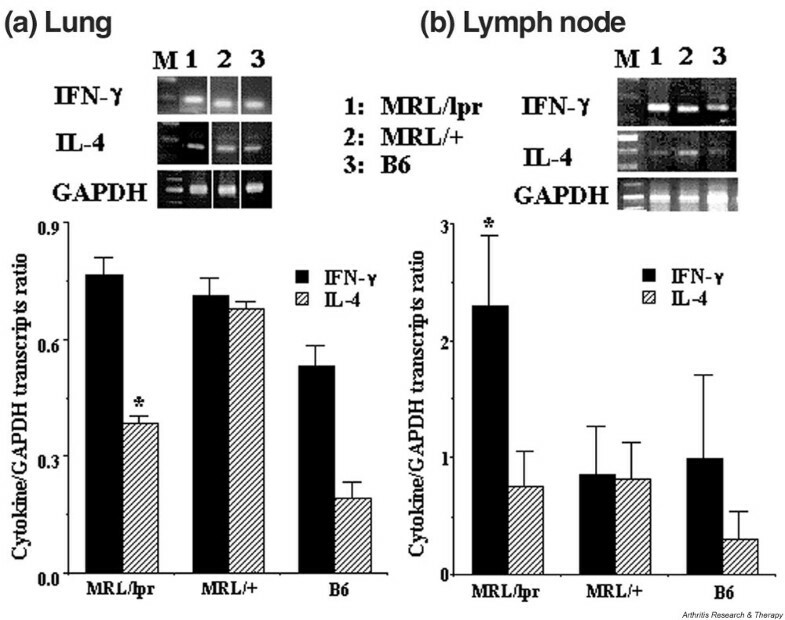 In MRL/lpr mice, transcripts of IFN-γ were significantly up-regulated in the lymph nodes (Fig. 8b) but not in the lungs. In contrast, IL-4 expression was down-regulated in the lungs (Fig. 8a), but not in the lymph nodes, in comparison with the expression in MRL/+ mice. Time course of TARC and CCR4 transcription in the lungs of 1- and 4-month-old MRL/lpr, MRL/+, and B6 mice. Whole RNA was isolated from lung tissues, and transcribed mRNA was amplified by RT-PCR. (a) Representative expression of TARC and CCR4 mRNA; GAPDH primers were used as an internal control. Data are representative of three independent experiments. Lane M: molecular weight markers (100-base-pair ladder). (b) TARC and (c) CCR4 transcripts were quantitated and expressed relative to GAPDH as the TARC/GAPDH or CCR4/GAPDH transcripts ratio. Data are expressed as mean ± SEM of three independent experiments. (b) *P < 0.05 vs 4-month-old B6 mice; **P < 0.01 vs 1-month-old B6 mice. (c) *P < 0.05 vs 1-month-old MRL/+ mice and 4-month-old MRL/+ mice and B6 mice, **P < 0.01 vs 1-month-old B6 mice. CCR4, TARC receptor; GAPDH, glyceraldehyde-3-phosphate dehydrogenase; RT-PCR, reverse transcriptase polymerase chain reaction; TARC, thymus- and activation-regulated chemokine. Determination of IFN-γ and IL-4 transcripts in the lungs and lymph nodes of 4-month-old MRL/lpr, MRL/+, and B6 mice. Whole RNA was isolated from lung and lymph node tissues; transcribed mRNA was amplified by RT-PCR. Representative expression of IFN-γ and IL-4 transcripts in the lungs (a) and lymph nodes (b); GAPDH primers were used as an internal control. Data are representative of three independent experiments. Lane M: molecular weight markers (100-bp ladder). Transcripts of IFN-γ and IL-4 mRNA were quantitated and expressed relative to GAPDH as the IFN-γ/GAPDH or IL-4/GAPDH transcripts ratio. Data are expressed as mean ± SEM of three independent experiments; (a) *P < 0.05 vs MRL/+ mice; (b) *P < 0.05 vs MRL/+ and B6 mice. GAPDH, glyceraldehyde-3-phosphate dehydrogenase; RT-PCR, reverse transcriptase polymerase chain reaction. MRL/lpr mice develop a spontaneous autoimmune SLE-like disease, characterized by progressive lymphadenopathy, hypergammaglobulinemia, autoantibody production and renal injury. Furthermore, as demonstrated previously and in the present study, the condition is associated with infiltration of mononuclear cells and inflammation of the lungs. CD4+ T cells, macrophages and B220+ T cells seem to be major infiltrating cells in the lungs of MRL/lpr mice [23, 26]. In the present study, we demonstrated enhanced expression of both IP-10 and its counterpart, CXCR3, in lungs of MRL/lpr mice, and that such expression correlated positively with the degree of pulmonary cell infiltration and inflammation, in comparison with MRL/+ and non-lupus-prone control mice. Flow cytometric analyses of MRL/lpr lungs revealed that the specific cells expressing CXCR3 were infiltrating CD4+ T cells, macrophages, DN B220+ T cells and to a lesser extent CD8+ T cells, which correlated with the degree of infiltration of mononuclear lymphocytes. Our results on IFN-γ (Fig. 8) are in agreement with those of previous studies, which demonstrated elevated levels of IFN-γ in MRL/lpr lupus-prone mice [25, 27–31]. Other studies indicated that the cell accumulation and inflammation seen in MRL/lpr mice is regulated by IFN-γ receptor signaling pathway . In addition, inhibition of IFN-γ by deletion of IFN-γ gene or by injection of cDNA encoding IFN-γR/Fc caused disease amelioration of MRL/lpr mice [30, 31, 33]. These results suggest that the Th1-type cytokine IFN-γ likely plays a crucial role in the development of murine lupus, as does IL-12, which induces Th1 T cell differentiation and IFN-γ production by T cells . It is believed that Th1 cells and Th1-type cytokines play an important role in the development of certain rheumatic diseases. CXCR3 is preferentially expressed in Th1 in comparison with Th2 cells, and Th1 but not Th2 cells respond to IP-10 [35–37]. IP-10 and CXCR3 are expressed in the inflamed synovium of rheumatoid arthritis, and seem to have an important role in the recruitment of Th1-type cells into the joint cavity [38–40]. Likewise, increased expression of IFN-γ and predominance of Th1 response are observed in human SLE and further in another lupus-prone NZB/W mice [27, 41], and exacerbation of SLE and lupus-like syndrome in myeloproliferative disease was induced by treatment with IFN-γ [42, 43]. Similar to the findings of the present study, in sarcoidosis, a disease characterized by a typical cell-mediated Th1-type inflammatory response, it has been shown that infiltrating lung T cells express both IFN-γ and CXCR3 but not IL-4 and CCR4 [44–46]. Taken together, our results and those of previous studies suggest that IP-10 is involved in the migration of Th1 cells, through CXCR3, to the lung and in the development of pulmonary inflammation and damage. IP-10 seems to be produced preferentially by macrophages as demonstrated in our immunohistological study (Fig. 4). Although our study did not directly identify the factors that regulate the production of IP-10 by macrophages, we speculate that IP-10 secretion is stimulated by IFN-γ-dependent activation of macrophages, based on the evidence described above, and also that IFN-γ is a potent inducer of IP-10 from many cell types . We could not detect a significant difference in the levels of IFN-γ expression in the lungs of MRL/lpr and control mice, though such difference was clearly noted in the lymph nodes (Fig. 8). We are unable to explain the reason for the insignificant difference in the lung IFN-γ between MRL/lpr and control mice, and why no significant increase in IP-10 expression was observed in MRL/+ lung (Fig. 3), in spite of a similar degree of expression in lung IFN-γ between MRL/lpr and MRL/+ mice. In this regard, a more recent study by Ogasawara and colleagues has demonstrated that IFN-α/β-mediated signals are required for induction of the IP-10/CXCR3 system in CD8+ T cells . Therefore, increased IP-10/CXCR3 induction in the lungs of MRL/lpr mice may be regulated via not only IFN-γ- but IFN-α/β-dependent signals. Although it is possible that regulation of IP-10 expression, as well as Th1 responses, may be mediated by differential mechanisms between lymphoid and nonlymphoid tissues, this question needs to be addressed in future studies. In contrast to IP-10/CXCR3, the expression of TARC and CCR4 in the lung of MRL/lpr mice was relatively lower than in MRL/+ and B6 mice (Fig. 7). The interaction between CCR4 and TARC (or macrophage-derived chemokine) has been described as the primary requirement for various biological phenomena such as recognition of memory T cells and recruitment of Th2 cells into the allergic airway . Collectively, these data indicate the important role of the IP-10/CXCR3 axis rather than the TARC/CCR4 axis, in the recruitment of specific inflammatory cells into the lung during pulmonary inflammation in lupus-prone mice. In contrast to the findings of other investigators and the present study, Peng and colleagues  demonstrated using cytokine knock-out mice that IL-4 and IFN-γ play a positive role in the pathogenesis of organ damage and inflammation in MRL/lpr mice. Other studies demonstrated that increased expression of IL-4 was seen in B cells of SLE patients and CD4+ T cells of lupus-prone mice . In addition, it has been demonstrated that the induction and development of experimental lupus is dependent on two stages of T cell activation and cytokine secretion: an early Th1-dominant stage represented by high IL-2 and IFN-γ expression followed later by a Th2-dominant stage represented by increased expression of IL-4 and IL-10 . Autoantibody production remains the hallmark of both human and murine lupus, suggesting a requirement for cytokines produced by Th2 cells in autoreactive B cell activation. Taken together, these findings suggest that not only Th1 responses, but also Th2 responses may be involved in autoimmune-prone mice. We did not provide a direct demonstration of the role of the IP-10/CXCR3 pathway in the pathogenesis of pulmonary infiltration in MRL/lpr mice, and at present it is difficult to answer how the lpr gene abnormality is associated with preferential activation of Th1 responses. Available data in this report and others, however, demonstrated a good correlation between the relative predominance of Th1 cells and accelerated development of lupus-like organ damage, including the lungs and kidneys [24, 25, 27, 28]. We speculate that this mutation modulates the expression and regulation of cytokines or other molecules involved in the polarization of Th1 responses. Recent data suggest that Th1 cells and Th1-derived cytokines play an important role in the development of the progressive lupus-like pathology seen in MRL/lpr mice. Our results suggest that IP-10 expression in the lung plays an important role in the interstitial pulmonary involvement associated with the migration of Th1 cells, through CXCR3. = T helper type 2. Presented in part at the 67th Annual Scientific Meeting of the American College of Rheumatology, Orlando, FL, USA, October 2003. We thank Mrs Hiroko, T Takeuchi, and Tomoko Akabane for expert technical assistance. This study was supported in part by the Uehara Memorial Foundation and the High-Technology Research Center Project (Ministry of Education, Science, Sport, and Culture of Japan).